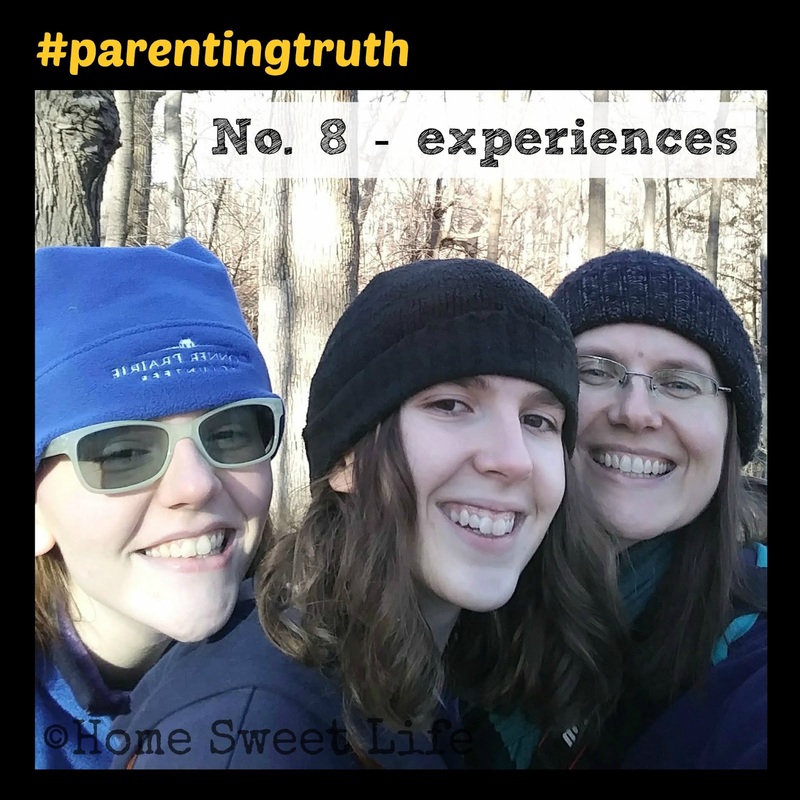 Today’s #parentingtruth is about valuing experiences over things. As a mom, I have often wanted to give my children gifts to express my love for them. But giving them another gift was not always feasible, or even realistic. Maybe it was because they already had too many things in their room, or because buying a present was not in the budget. The truth is most things are temporary, while experiences provide memories that can last a lifetime. When I was almost three years old, my family moved into the house where my mom still lives today. We had visited a few times over the summer and fall as the house was being built, and I do still have a few distinct memories of those visits. Fast forward a couple of years. On a fall afternoon, my parents took us outside and sat down in the grass in the small side yard. My dad asked my older brother and me to go search and see how many different kinds of leaves we could find in the yard. Since I was still pretty little, it made sense to wait for Autumn, when the leaves were starting to fall off the trees. While I don’t remember how many kinds of leaves we found, I do still remember the experience. Even though it has been almost 40 years since that afternoon, I can remember my parents sitting side by side, encouraging us to go look for leaves. I remember that it was not a race, or a competition, but rather a chance for them to instill in us a love of discovering the outdoors. What have you done with your children lately that has created a memory? Memories are the things that matter most to children. Whether you are rich or poor, you can create good memories. But a word of caution: you can also create bad memories, so think before you speak. Think about what memories you want your children to have 40 years from now. Do you want them to remember a stressed out mom, or someone who made cookies with them on snow days? Do you want them to remember an over-exacting father for whom no one ever measured up, or would you rather they remember going hiking with you or playing silly board games? There are other practical reasons to choose to give your children experiences over things. The less stuff you have in your house, the less time it will take to clean it. I am not a minimalist, but I do appreciate it when everything has place, and gets put away when you’re done using it. Now that our youngest has graduated high school, we are doing another purge of books from the house. We still like having books, but I no longer feel compelled to have our house resemble the Library of Congress with one of everything - LOL! When you choose to provide your children with experiences over things you provide them with a lifetime of doing. A life of experiences can be had in any socio-economic class. That means you can be poor and still provide a wonderful, well-balanced experience filled childhood for your kids. I was the queen of doing things on the cheap. These days it is trendy to be frugal, but even back then I knew we could do fun activities without spending money we didn’t have. I would ask around to find out about low and no cost days at local museums. 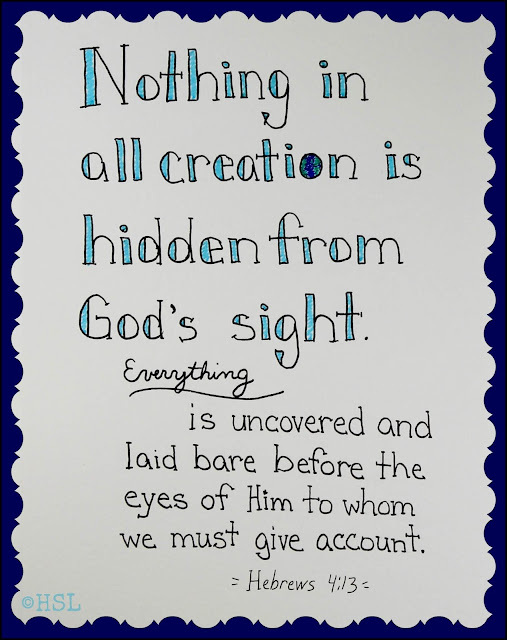 There were activities put on at the local college that were free or practically free for homeschoolers. It just took some effort. I let my business contacts know that we liked music and art. One of them had a sister who worked for the local symphony. We went to the free school symphony performance multiple times. If we could not afford to pay to go to an event, we could often find a way to volunteer for it and still get some of the benefits. We went to amusement parks through the Read to Succeed program, ate free lunches thanks to Book-It, and asked for memberships for birthday or family gifts. One of the best choices we have made over the years is to always purchase an Annual Entrance Permit to our state park system. There are a wealth of free programs through our state’s Department of Natural Resources and most of them occur at state parks. With a park pass we could pack up the lunch we were going to eat at home anyway and turn these free events into memorable road trips. A life of experiences, a life spent doing things, is often a life spent outdoors. This was one of my favorite parts of our daughters’ childhoods: going outside! We lived life together, riding bikes, hiking trails, watching birds, eating picnics, searching for pictures in the clouds or watching the meteor showers. We still love to go outside together. When you buy things, they are often for a specific person. That can be a good thing, like a wedding ring. There is nothing wrong with giving and receiving gifts. I happen to really like dark chocolate and orange roses. But those are things for me, not necessarily things for sharing. A life filled with experiences over things is time spent sharing life together. That’s what family is about - being together. You will end up sharing the good and the bad, but hopefully most of it will be good. Hi all! Just a super quick note today. For the sale, you can get a new membership to SchoolhouseTeachers.com for $111 for a year, plus a print copy of the Hey Mama! planner mailed to your door. This is a really good sale, and if you stay a member, your annual renewal will always only be that $111 price. I'd tell you more about SchoolhouseTeachers.com, but I cut my fingertip yesterday, and it is really hard to type with only 9 fingers -LOL! 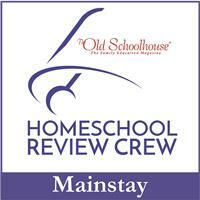 So go check out some of my previous reviews by clicking the orange SchoolhouseTeachers.com tag at the bottom of this post. And remember, the sale ends tomorrow at midnight - don't miss it! 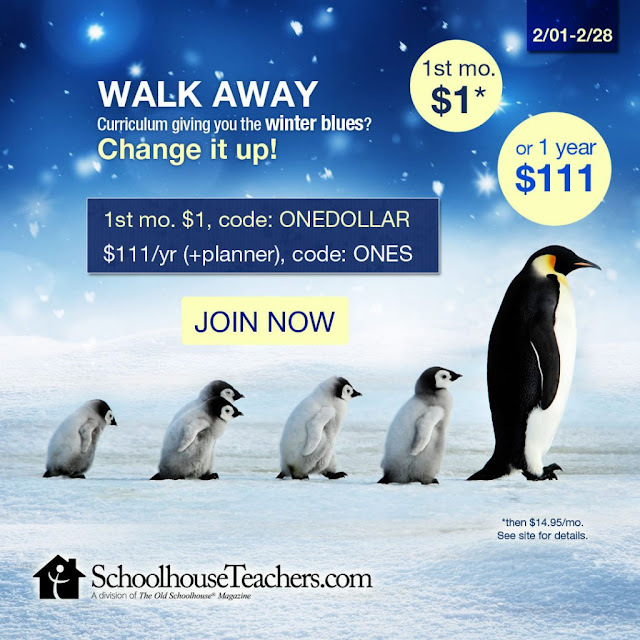 Don’t let Winter Blues take over your homeschool! Fresh ideas await at SchoolhouseTeachers.com. Annual membership only $111 (code ONES), plus free spiral-bound planner; Monthly membership only $1 for first month (ONEDOLLAR) – $14.95/mo after. Hundreds of resources! 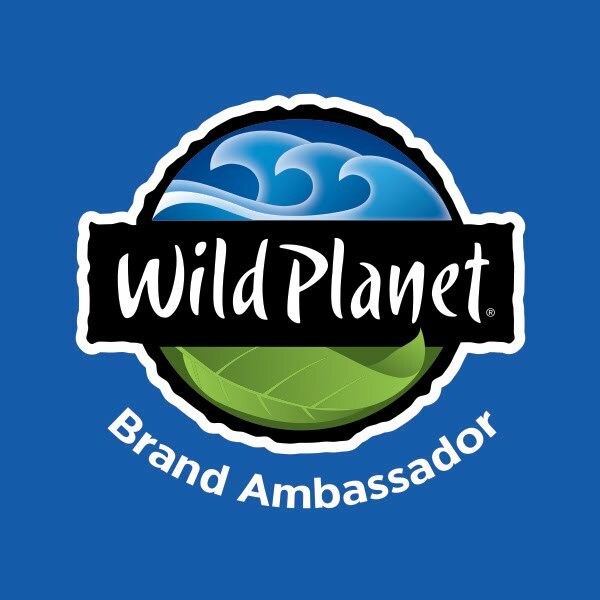 Ends 2/28/19! When we realize the we are not supposed to do this parenting thing on our own, or in our own strength, a huge burden is lifted from our shoulders. The answers that we seek, and the wisdom that we need for parenting, are found in a personal relationship with Jesus. 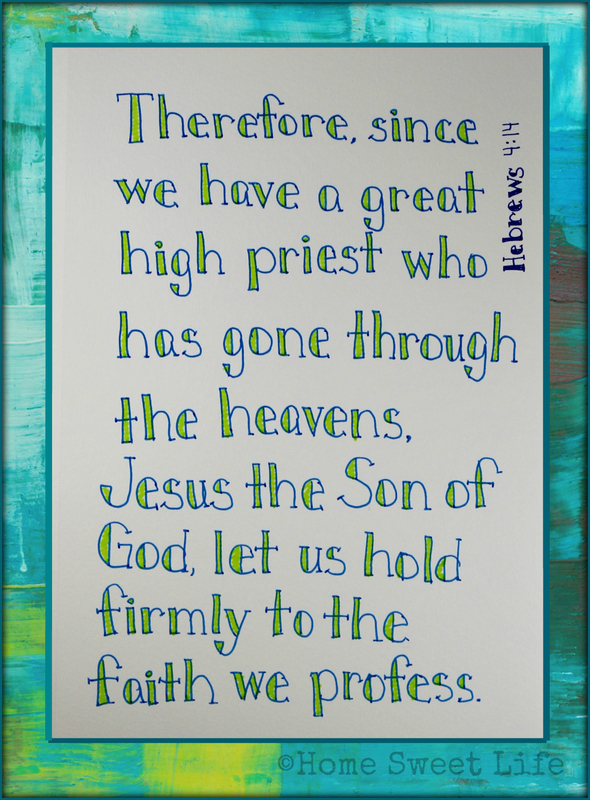 When we are following Jesus, He leads us into the presence of the Father. Here we learn about love, forgiveness, and grace. These are all important truths to embrace in our roles as parents. It can be hard enough to find the right answers with help, I would not want to do it alone. By the grace of God we can be gentle, even when we’re down to our last nerve and our toddler is using it as a trampoline. By Jesus’ example, we can see that putting others first is our best opportunity to introduce them to the love of the Father. When we begin to grasp how great God’s love for us is, we bow under the mercy and forgiveness He offers us. 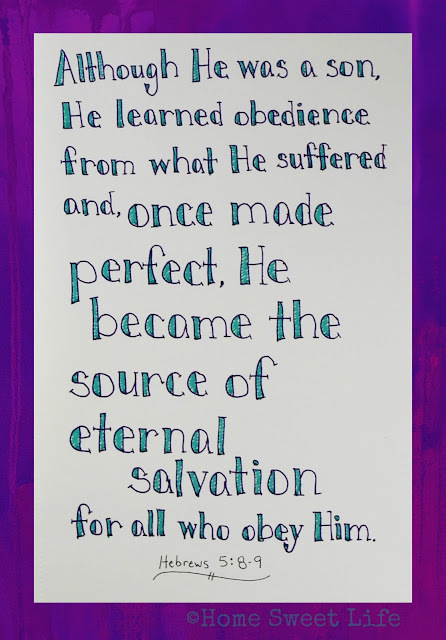 These lessons teach us how to love our own children, just as He has loved us. Forgiveness is a hard concept to explain to someone with words, but it is understood when they see it lived out. We cannot expect our children to learn all of these valuable lessons the first time. When we remember the patience that God has shown to us, as we have been learning from Him, it provides us with the example of forgiving someone seventy-times-seven. This is something especially important to remember when your children get to around age 11. 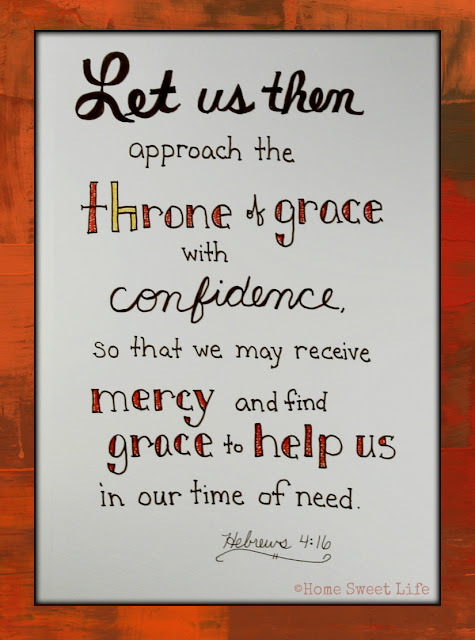 Having a relationship with Jesus, one where we spend time reading His Word, praying, and asking for wisdom, is the best opportunity we have to be prepared for whatever tough situation may come our way as parents. Jesus teaches us about letting go of fears, of finding joy in the journey, and loving others well. 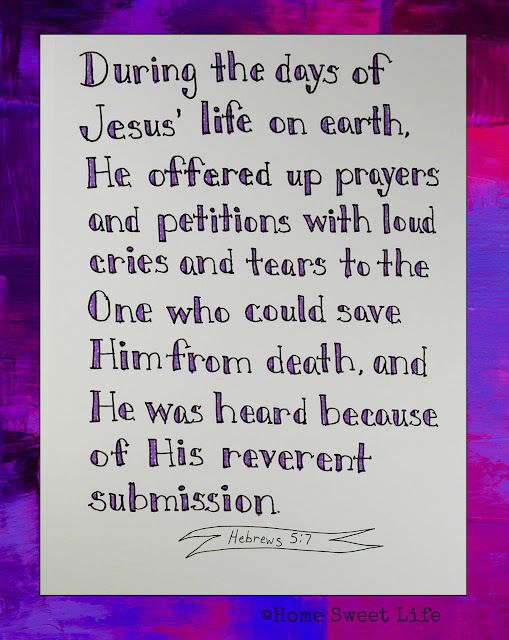 Jesus modeled how to go away to a quiet place and spend time with the Father. He showed us how to listen well and to find needs and meet them. Jesus was confident in His position as a child of God, and you should be too. If you are unsure what it means to have a personal relationship with Jesus, then I encourage you to start by reading the Gospel of John. You can read it online - for free- at www.biblegateway.com. 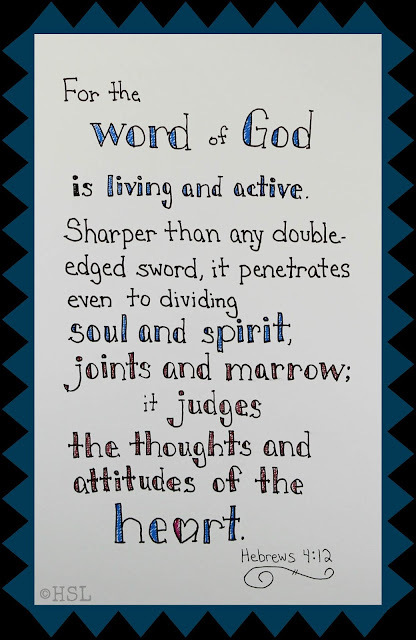 Then talk to a friend, or visit a local church and speak to someone there about what it means to follow Jesus. Parenting is full of joys and sorrows, challenges and successes, and every single one of them is better with Jesus! How many times have you been at an outdoor event, like a concert in the park, or a street fair and wondered about the children you encounter? Some of them are so well mannered and polite, while others run around like holy terrors. Ever wonder what the difference was? 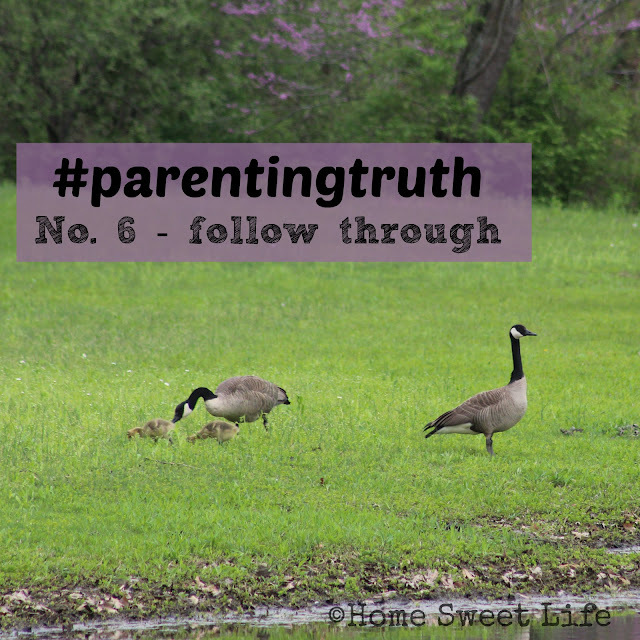 I have a hunch it relates to today’s #parentingtruth: follow through, or, in one word: consistency. 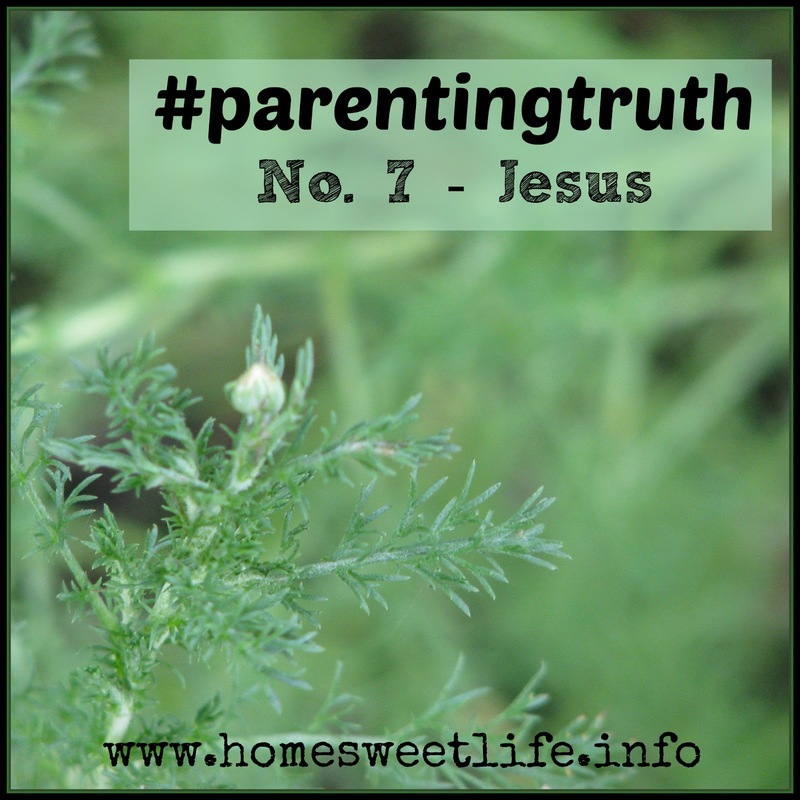 Oh, I can hear some of you moaning already, and trust me, I feel your pain - but I am here today to tell you that this one #parentingtruth is the biggest thing short of Jesus that is going to change your family’s day to day life! What exactly is follow through? It is you, deciding each and every hour of every day that you are going to show up for your job as a parent. Follow through equals consistency, and that brings peace. Consistency in the house rules, consistency in discipline when needed, and consistency in love and forgiveness. Someone is going to be running and ruling your household - it can be you - or it can be your kids. I vote for you! Consistency means expecting the same (good) behavior from your children every day. It starts when they are just infants, and it lasts a long as they live in your house. It requires you, as the parent, to follow through with unpleasant consequences each and every time they willfully misbehave. This is not about being strict, it is about being consistent. Your kids really need you to be consistent. They will test the boundaries often, but they are doing that because home is a safe place - or it should be - and they want to know that you are still there, and that you still care. I know it can be hard to be consistent with consequences when yo are already oh-so-tired. A long day at work after a longer night spent caring for a sick or scared child makes it even harder to be consistent… but little eyes and ears are watching and listening… so keep on keeping on! Do not make idle threats to your children when they misbehave - show them the consequences of their behavior, and they will realize that you are willing to follow through, even when you’re tired, it is inconvenient, or you need to excuse yourself and that child from the public eye while you address the issue. I have seen too many families fall into chaos when the older kids hit the teen years because dad and mom were not consistent when the kids were littler. Do you want an adolescent living in your house, or a rebellious teenager? Your follow through, or lack of it, decides which you will end up with. Loving, gracious parents know that children need discipline. 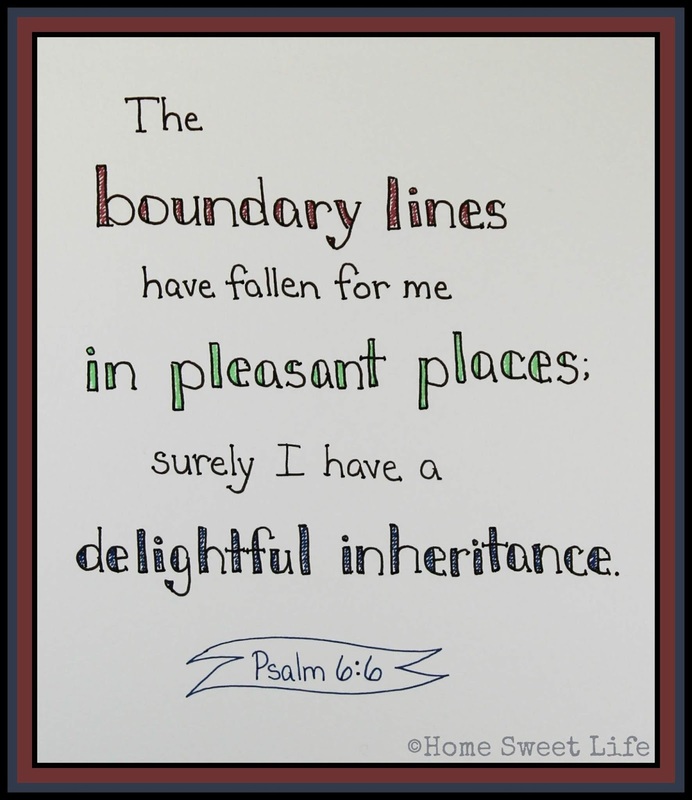 Loving, kind parents extend grace, but still require their children to face the consequences of sin. 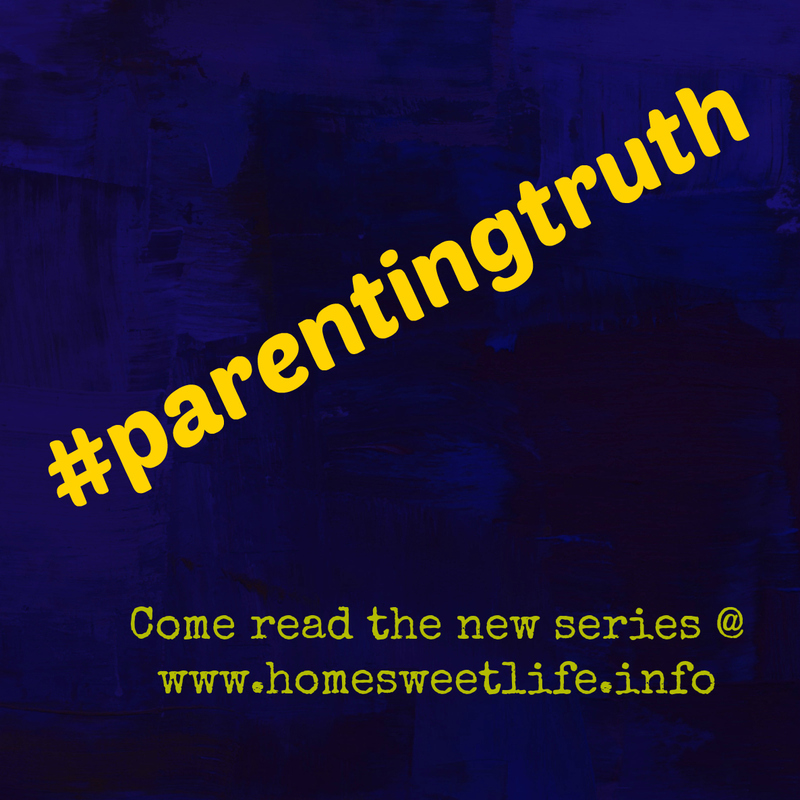 My husband and I have made lots of mistakes along the way in this parenthood journey, but we have always tried to be consistent with follow through. The results of consistent follow through mean that one day yours will be the well behaved children. It is worth the effort! Training good behavior is like starting any other good habit - it takes time. While you can probably train the habit of daily tooth brushing to your children in about a month, it is going to take longer for for training their behavior - because you are training their hearts. We train our children to obey by setting our own example of obedience to God. We are not perfect, and our children are not either, so it will take time. Be patient with yourself, and with them. Sometimes the consequences of their misbehavior are going to cause them, and you, to miss out on something fun you’ve planned. This is the stinky part of parenting, but it is necessary. It allows you to teach the lesson that sin hurts others, not just ourselves. A big part of consistency is requiring your children to go back and re-do the thing they did wrong the correct way. This modeling of the correct behavior leaves a lasting impression. Our girls were very little when they learned that it is NOT ok to grab at Mama’s glasses. That same lesson can be taught for necklaces car keys, etc. It takes much less time to establish good habits than to break bad ones. So start as young as you can - and practice follow through on a daily basis. Take heart mom and dad - you can do this! I’m cheering for you. I’ve seen what great rewards await on the other side of your daily struggle to follow through with your parenting choices. It’s worth it! Today’s #parentingtruth is this: a little dirt won’t hurt.When I was a child we usually played outdoors and we got dirty often. My brother’s best friend lived on a small farm and we would often play in their yard or barn when we weren’t in our own back yard. Don’t be afraid to let your kids get dirty. Childhood is a wonderful time to be messy: to play in the sandbox, to make mud pies, to ride bicycles and to use finger paints. Kids are extremely washable! I am so thankful that my parents sent us outdoors to explore and have fun at a young age. It was habit that has lasted a lifetime. I had a wonderful childhood, and it led me to want something grand for our own daughters’ childhoods. Now before you get upset and tell me that the world is a different place today than when I was child and you cannot let your kids outside by themselves, stop and listen. I am going to tell you the same thing I tell the readers of my newspaper columns: go outside with your kids! I know the world is a scary place, and I know you want your kids to stay safe. I also know that childhood should be lived outdoors as much as possible - so go outside with your children. Along the way, your kids are going to end up eating some dirt, or sand, or drinking some pool water. These things an inevitable, but not necessarily bad. When Arlene was almost a year old, we repeatedly found her eating dirt. She would scoot over to the table where I had my vegetable seedlings growing and reach up and pull out the popsicle stick markers and lick the dirt off of them. For three days in a row, while Emily was helping me plant the garden we caught Arlene with a muddy face and a chunk of dirt in her hand. Instead of it freaking me out, like it would a lot of modern parents, it made me laugh. I ran inside on the third day to grab the camera and took the above picture of her cute muddy face. No harm, no foul, it was just some dirt. 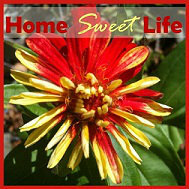 We didn’t use pesticides or fertilizers on the yard, so there was nothing to be afraid of. Interestingly enough, I read an article about a year later where researchers were studying whether the good bacteria in our soil could be used to help treat people’s gut issues. While the research on Homestatic Soil Organisms (HSOs) ended with mixed results, I will tell you that our dirt and sand eating redheaded child was rarely sick. Maybe it was the dirt, maybe it was the Vitamin D from all the time she spent out in the sunshine, but either way, Arlene had a healthy childhood that I credit to eating a lot of fruits and vegetables and spending time outdoors. Her sister was always calmed as a baby by going outside or at least opening a window and letting the fresh air in. Even today, one of Emily’s favorite scents is the smell of wet dirt after a spring rain. 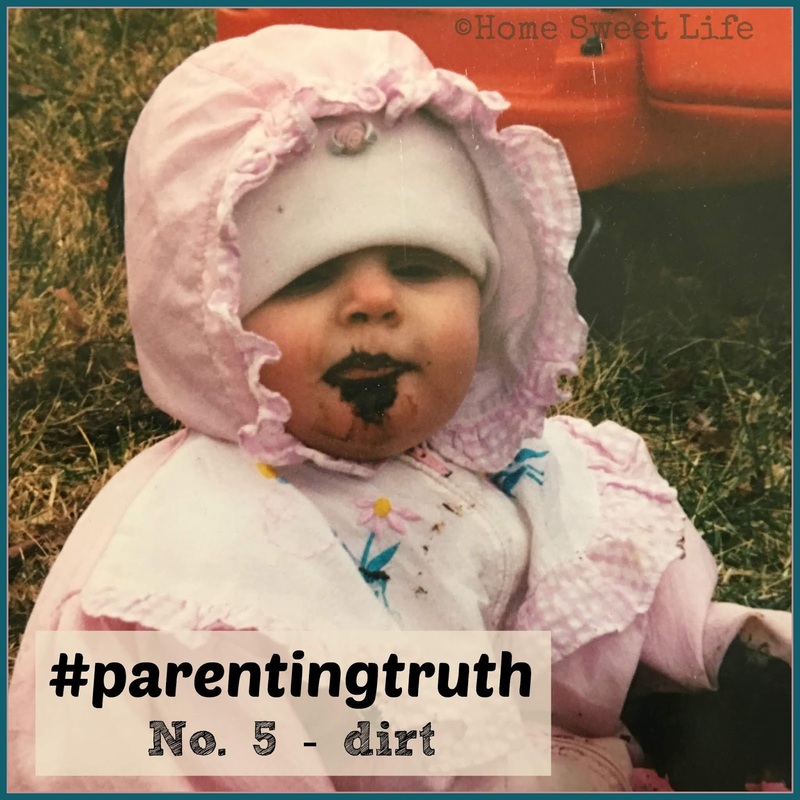 There’s another important part to today’s #parentingtruth about getting dirty: it helps you appreciate being clean. When we let our young children get well and truly dirty, we create natural teachable moments about cleaning up after ourselves and taking a bath. Your kids might be dirty from making cookies in the kitchen, digging for worms in the garden or helping dad with a project in the garage. When kids are really dirty after a full day of work and play, they learn how to scrub well to get clean before bedtime!